Here is Fr. Robert Barron quoting Cardinal Newman. Fr. 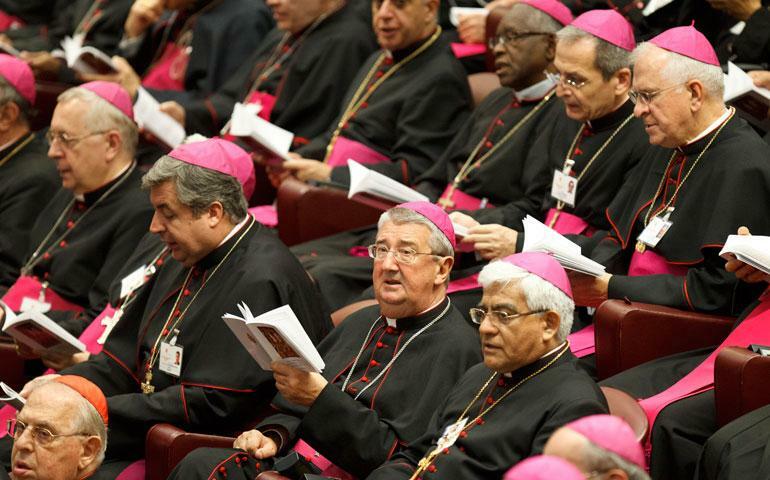 Barron brings to all the hand-wringing and garment-rending over the the synod a bracing blast of common sense. One of the great mysteries enshrined in the ecclesiology of the Catholic Church is that Christ speaks through the rather messy and unpredictable process of ecclesiastical argument. The Holy Spirit guides the process of course, but he doesn’t undermine or circumvent it. It is precisely in the long, laborious sifting of ideas across time and through disciplined conversation that the truth that God wants to communicate gradually emerges. If you want evidence of this, simply look at the accounts of the deliberations of the major councils of the Church, beginning with the so-called Council of Jerusalem in the first century right through to the Second Vatican Council of the twentieth century. In every such gathering, argument was front and center, and consensus evolved only after lengthy and often acrimonious debate among the interested parties. Read John Henry Newman’s colorful history of the Council of Nicaea in the fourth century, and you’ll find stories of riots in the streets and the mutually pulling of beards among the disputants. Or pick up Yves Congar’s very entertaining diary of his years at Vatican II, and you’ll learn of his own withering critiques of the interventions of prominent Cardinals and rival theologians. Or peruse John O'Malley’s history of the Council of Trent, and you’ll see that early draft statements on the key doctrines of original sin and justification were presented, debated, and dismissed—long before final versions were approved. Until Vatican II, these preliminary arguments and conversations were known only to the participants themselves and to certain specialist historians who eventually sifted through the records. The great teachings of the Councils became widely known and celebrated, but the process that produced them was, happily enough, consigned to the shadows. If I might quote the great Newman, who had a rather unsatisfying experience of official ecclesial life in Rome: “those who love the barque of Peter ought to stay out of the engine room!” This is a somewhat more refined version of “those who enjoy sausage ought never to watch how it is made.” The interim report on the Synod represents a very early stage of the sausage-making process and, unsurprisingly, it isn't pretty. Two more weeks of discussion will follow; then a full year during which the findings of the Synod will be further refined, argued about, and clarified; then the Ordinary Synod on the Family will take place (the one going on now is the Extraordinary Synod), and many more arguments and counter-arguments will be made; finally, some months, perhaps even a year or so, after that, the Pope will write a post-Synodal exhortation summing up the entire process and offering a definitive take on the matter. At that point, I would suggest, something resembling edible sausage will be available for our consumption; until then, we should all be patient and refrain from bloviating.